Employee of the Month - June 2016 - Bond Clinic, P.A. Bond Clinic, P.A. 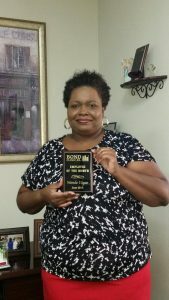 Congratulations to Wanda Ulysse for being selected as the June 2016 Employee of the Month at Bond Clinic! Wanda works in the Data Processing Department as an Accounts Receivable Representative. She began her employment at Bond Clinic in June of 2005.